Christmas was yesterday, but here's a nice little late present for everyone. 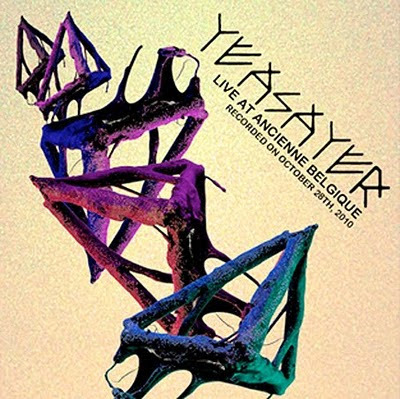 Yeasayer, one of my favorite new groups, has recently released a live album with the always nice price of pay-what-you-want. Odd Blood, their second album, is among my Top 10 of 2010 (check back this week for the top album lists from the JamandaHalf fam), and hearing their songs lives is a great testament to their ability as a band. With a band like Yeasayer which relies heavily on layered production, stitching various musical fabrics into their funky musical tapestry, sometimes their live shows can lack in complexity, missing the fullness that is present in their recorded albums. However, this live album is just as rich as their two albums, perhaps even exhibiting an added vibrancy which is always welcome to hear. Tracks 2-5 off of Odd Blood always amaze me. Back to back to back to back hits, each one conquers a sound and emotion, each one shows off a different side of the band. The track that opens up their new live album, "Madder Red" is the gorilla glue that reins in the other three, allowing them to be three different panels on Yeasayer's funky tapestry rather than a incoherent group of individual panels. Super dope its in own right, this song is a bright stroke of indie pop that is a clear standout, especially on this new live album. Enjoy.